The following letter was sent by the Executive Director of Human Rights Watch, Kenneth Roth, in response to an open letter signed by scores of analysts of U.S.-Venezuelan relations, criticizing findings by HRW’s Americas Director, José Miguel Vivanco. In originally releasing the Vivanco letter, COHA took the organization to task over its highly critical report on the human rights situation in Hugo Chávez’s Venezuela, which was authored by Vivanco. In his letter of response, Roth rebuts the weaknesses that more than 100 scholars and experts in the field identified in HRW’s report and aggressively defends his organization’s, as well as Vivanco’s, methods and findings. As with the original letter, COHA is distributing Roth’s reply to its mailing list without comment, and welcomes any thoughtful responses or observations. I am writing in response to your letter concerning our recent report, “A Decade Under Chavez: Political Intolerance and Lost Opportunities for Advancing Human Rights in Venezuela.” Since your names appear on the press release that accompanied the letter, I am assuming that you were involved in drafting the document and asking others to sign it. I hope that you will share our response with the other authors and signatories. Your letter contains dramatic allegations regarding the content of the report and the motives of those who wrote it. You claim that the report “does not meet even the most minimal standards of scholarship, impartiality, accuracy, or credibility.” You claim that it relies excessively on opposition sources, that it makes sweeping allegations without factual support, and that it ignores and even endorses unlawful efforts to undermine the government. You also claim that the report was “politically motivated,” and you offer as proof a newspaper quotation of our Americas director, José Miguel Vivanco. Human Rights Watch takes criticism of this nature very seriously. Our ability to effectively promote human rights around the globe depends in large measure on the credibility of our reporting. We have therefore reviewed your letter with great care, examining each of your claims to determine whether the problems you identify are real and warrant further attention. After a careful review, we have found that the allegations in your letter do not stand up to scrutiny. The issues covered in our report have been thoroughly researched and the substantive findings are based on a wide range of diverse and credible sources. In seeking to prove otherwise, you have misrepresented both the substance and the source material of the report. You have criticized us for making arguments that we have not made. You have taken our words out of context (including the quotation you attribute to Mr. Vivanco) and distorted their meanings in order to make your points. The human rights problems we have documented in Venezuela are very real and deserve serious attention. By disseminating unfounded allegations regarding our report, your letter provides little more than an unhelpful distraction, which, as I will discuss further below, can only serve to undermine legitimate efforts to promote human rights in Venezuela. One of your main allegations is that our report suffers from an “overwhelming reliance” on “opposition sources.” Specifically you claim that the report “depends heavily” on three newspapers aligned with the opposition (El Universal, El Nacional, and Tal Cual) and one nongovernmental organization (Súmate). This allegation has no merit. What you omit from your letter is any consideration of the other 92 percent of the citations found in our report. These citations refer to information from a wide array of publications, as well as actors of all political persuasions, including government officials, state entities, international rights monitoring bodies (such as the Inter-American Commission on Human Rights and the International Labor Organization), judges, prosecutors, jurists, pro-government and independent journalists, community radio broadcasters, scholars, and trade unionists, among others. Of course, proportions of footnotes tell only part of the story. The more important part is the fact that our authors did a painstaking and rigorous job investigating all the issues in the report, seeking out multiple and diverse sources, corroborating the information wherever possible, and providing extensive citations so that readers would be able to evaluate the strength of each piece of evidence in the document. Your letter highlights a single footnote that you would consider to be unacceptable under any circumstances. That footnote cites an online article posted by an opposition blogger who is vehemently anti-Chávez and has published offensive commentary in the past. What you do not mention, however, is that this citation is for an assertion that is entirely uncontroversial and in no way critical of the government. The footnote backs the sentence: “The designers of the Maisanta program justified the program as an effort to democratize access to information.” What you may not have realized is that the citation does not refer to anything written by the blogger, but rather to a photo image reproduced in his article that shows the actual text of the Maisanta software (in which its designers present their justification for their program). To claim, as you do, that this footnote is evidence of a “deep political prejudice” is simply far-fetched. Another one of your main accusations is that our report “makes sweeping allegations that are not backed up by supporting facts or in some cases even logical arguments.” Yet this sweeping allegation is itself unsubstantiated. The primary example you use to attempt to back this accusation is our conclusion that discrimination on political grounds has been a defining feature of the Chávez presidency. To make your point, you isolate a single case of a woman purportedly denied medicines on political grounds, and claim falsely that it is the “only alleged instance of discrimination in government services cited in the entire 230-page report.” We actually provide three such cases that we documented ourselves, while also referencing a 2005 report by the Inter-American Commission of Human Rights that concluded, on the basis of hundreds of cases of alleged discrimination, that a “new discriminatory pattern” in the awarding of “work and public services” had emerged in Venezuela. Moreover, our report presents the examples involving public services as just one facet of a much broader pattern of political discrimination. Chapter 2 of the report, which introduces the theme of political discrimination, provides a detailed analysis of six illustrative cases, and the subsequent chapters on the media, organized labor and civil society document a wide range of additional cases that have affected tens of thousands of union members, many journalists, and some of the country’s leading human rights advocates, among others. Your letter also complains that “the report does not show, or even attempt to show, that political discrimination either increased under the current government (as compared to past governments), or is more of a problem in Venezuela than in any other country in the world.” This is true: we don’t. In fact, the report clearly states that discrimination was a major problem in Venezuela under previous governments, citing a 1993 Human Rights Watch (then Americas Watch) report in which we also highlighted the problem. We credit the Chávez government for “uproot[ing] the established system of political discrimination” that it inherited in 1999. The problem is that, after 2002, the government replaced the old forms of discrimination with new ones of its own. It is not our view—and certainly not the view of international human rights law—that a government should be immune from criticism for a human rights problem just because a similar problem existed under previous governments, or exists presently in other countries. The reason we conclude that political discrimination is one “defining feature” of the Chávez government is because it occurs in a wide range of areas, affects large numbers of people, and has been openly endorsed by top officials, including the president himself. The report says nothing of the kind. On the contrary, it clearly states that the internationally-protected right of workers to strike does not extend to strikes that have purely political aims (such as ousting an elected president). However, in the case in question (in which some 18,000 PDVSA employees were summarily fired and then blacklisted after a 3-month oil stoppage), the International Labor Organization (ILO) determined that the strike, while motivated in large part by political aims, had also encompassed a set of demands about the government’s economic policies. As such, it fell within the scope of legitimate strike activity which is protected under international law. The report also clearly states that the government was justified in taking steps to limit the damage of the strike and to hold individual strikers accountable for their direct involvement in criminal acts such as sabotage and conspiracy—provided that those steps were consistent with international labor rights protections and due process guarantees. The report does not disregard the serious allegations that RCTV participated actively in the 2002 coup. On the contrary, it highlights those allegations and clearly states that the government is fully justified in seeking accountability for those individuals who participated in the coup, or any other illegal efforts to topple a democratically elected president. However, we also maintain that the government, when seeking to promote accountability, must respect basic due process guarantees. This is a core principle that undergirds the rule of law in every democracy, including Venezuela’s. Nor does the report present the RCTV case as a “simple” example. On the contrary, it devotes substantial space (12 pages) to analyzing the intricacies of the case. The Venezuelan government was under no obligation to renew RCTV’s concession. The problem in this case was that President Chávez himself justified the non-renewal as a response to alleged criminal activity, without giving RCTV an opportunity to defend itself against the charges (a due process violation). Moreover, as the report demonstrates, it was clear that the real reason the government was denying a renewal to RCTV—while simultaneously granting one to another station that was allegedly just as implicated in the coup—was because of RCTV’s anti-government programming (an act of political discrimination). Nor does the report reproach the government for increasing the number of pro-government media outlets. It simply sets out what has happened as part of the factual description of the current media environment. What it objects to is how the government has violated international norms on freedom of expression by expanding the scope and severity of “incitement,” “insult,” and criminal defamation laws, created powerful incentives for critics to engage in self-censorship, and abused its control of broadcasting frequencies to threaten and punish stations with overtly critical programming. We do believe that governments should encourage greater pluralism in the media. What we don’t accept is the argument that they must disregard international free speech norms in order to do so. But the only way one can sustain this claim is by ignoring the rest of that interview and, most importantly, the argument laid out in our report. Both make perfectly clear that, when we speak of Venezuela as a “model,” we are referring to the human rights practices analyzed in our report. Our concern is not with what parties or politicians win elections, but rather that problematic rights practices will be replicated elsewhere. Venezuela is clearly among the most influential countries in Latin America today. There are multiple reasons for this. One is that President Chávez has used his personal charisma and vast oil resources to establish himself as a leading figure in regional politics. Another is that his government has embraced the banner of “participatory” democracy, an idea which has attracted the attention and, in some cases, the admiration of people in countries throughout the region. As a result, President Chávez’s approach to democratic rule has come to be regarded as a model by many. Human Rights Watch believes, as we state in the report, that promoting more inclusive forms of democracy in Venezuela and throughout the region is a “vital and ambitious aim.” Yet we also believe that this aim cannot be achieved so long as the independence of key democratic institutions, such as the judiciary, the media, organized labor, and civil society, are compromised. When President Chávez came to office a decade ago, he inherited a democratic system whose institutions were already deeply compromised. His first major accomplishment, the ratification of the 1999 Constitution, opened an historic opportunity for the country to overhaul its political institutions, shore up the rule of law, and advance the protection of human rights. Our report argues that this historic opportunity has been largely squandered. Since the failed coup of 2002 (which was the most dramatic recent setback for Venezuelan democracy), the Chávez government has effectively eliminated any meaningful judicial check on the presidency, strengthened the state’s power to curb press freedoms while abusing its regulatory power to threaten and punish critical media outlets, systematically violated workers’ basic right to freedom of association, and actively sought to discredit the valuable work of local human rights advocates. So long as the Chávez government continues to flout the human rights principles enshrined in its own constitution, we believe Venezuela will not achieve real and sustained progress toward strengthening its democracy—and will not serve as a useful model for other countries in the region. The last time I felt compelled to write you, Mr. Wilpert, was after your Web site disseminated a defamatory article about my colleague, Mr. Vivanco. That article claimed that Vivanco had been a functionary and public apologist of Chilean dictator Augusto Pinochet. This was a particularly noxious smear given that Vivanco is a Chilean lawyer who has devoted his entire career to promoting human rights in his country and throughout the region. It was a completely false and easily refutable allegation. This time you, along with Mr. Tinker Salas, Mr. Grandin, and others, have sought to disseminate less extreme but equally spurious allegations regarding Mr. Vivanco and Human Rights Watch. In our own case, Human Rights Watch has been subject to all sorts of charges about ulterior political motives in response to our reporting on Venezuela. In fact, the first time we heard the smear about Mr. Vivanco’s supposed ties to Pinochet was when the Chávez government invented it to distract attention from our public criticism of their court-packing scheme in 2004. The most recent time the Chávez government employed these tactics against us was last September when its security agents forcibly detained my colleagues and summarily expelled them from the country. At Human Rights Watch we are accustomed to having our reports provoke angry reactions. We are routinely subject to baseless allegations regarding our findings, our sources, and our motives. 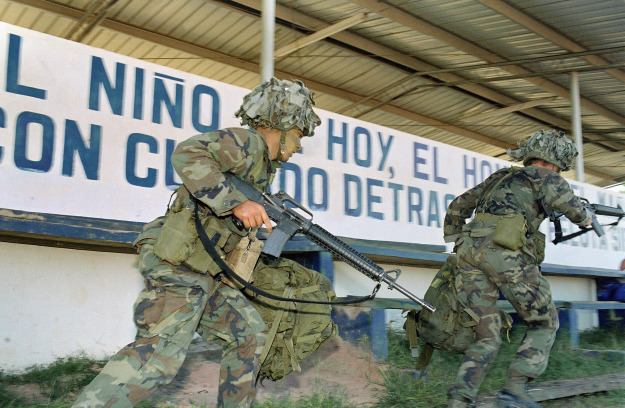 In Latin America, these attacks come most frequently in response to our work on Colombia. Just two months ago, for example, Colombian President Alvaro Uribe publicly accused Mr. Vivanco of being “an accomplice of the FARC” after he released a report in Bogotá. Typically, the aim of these attacks is to bully us into retracting our criticisms and watering down our findings. I firmly believe that the credibility which Human Rights Watch now enjoys around the globe is due in large measure to the fact that we have never backed down in the face of such bullying. I would like to take at face value your own professed concern for promoting accurate reporting on human rights in Venezuela. But I do not see how disseminating a grossly inaccurate depiction of our report can possibly contribute to that goal. Given what’s at stake in Venezuela today, I think your letter is an unhelpful distraction. If anything, its unfounded allegations will only contribute to the climate of political intolerance that currently exists in the country, undercutting local efforts to promote democratic pluralism and greater respect for basic human rights. Again, I hope you will share this response with the other authors of your letter and, in particular, the people you invited to sign it. I would also ask that you provide them with a link to our report so they can acquire a more accurate understanding of its contents.